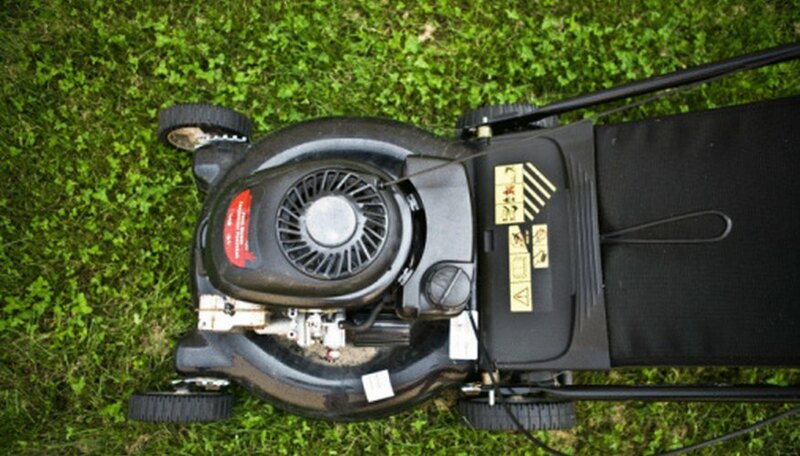 Leaving gas in your push lawn mower too long can cause the gas to go bad. Once this happens, the lawn mower will not start. You must drain the entire fuel system to get the mower back up and running. After the mowing season, always drain the gasoline from the fuel system or use a fuel stabilizer to keep the gas fresh for up to a year. This procedure will take 15 minutes to complete. Set the push mower on a hard, level surface. Locate the carburetor on the left side of the engine, directly under the air filter. Slide an oil pan under the carburetor to catch the gasoline. Slide the hose clamp on the fuel line away from the carburetor with needle-nose pliers. Pull the fuel line off the carburetor and aim the fuel line at the oil pan. Allow the gas to drain completely into the pan. Remove the bolt from the bottom of the carburetor with the crescent wrench and slide the bowl off the carburetor. Clean out the carburetor bowl by spraying with carburetor cleaner and then wiping clean with a rag. Spray the carburetor cleaner into the exposed jet that the bolt screws into that holds the bowl against the carburetor. Place the bowl back into position and tighten the bolt with the crescent wrench. Push the fuel line back onto the carburetor and slide the hose clamp back toward the carburetor. Fill the gas tank with fresh gas. Remove the air-filter cover and slide out the air filter. Spray a small amount of carburetor cleaner into the top of the air-filter holder; this will aid in the engine starting in case any stale gas remains in the carburetor. Start the engine and allow to run for several minutes until the engine runs smoothly. When the engine restarts, white smoke will bellow from the exhaust; this is residual bad fuel burning off. How do I Replace a Fuel Line on a Husqvarna Chain Saw Model 51?